Jason was on business trip last week but I managed to lead my 'normal' life. 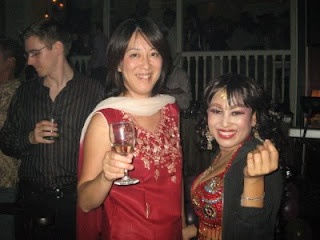 On Friday, while Christine was babysitting, I went to Bollywood dance night at Bagan. Bagan is a bar in Gurney and they from time to time have some special parties like this. 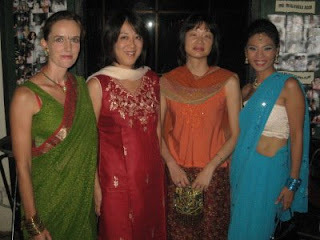 I feel a bit embarrassed with sari and bought a punjabi suit in Little India (60 RM, GBP12, 1800JPY). I put a red sticker on my forehead as well to be more Indian! Last week, I went to Little India as well to have face threading at Santhi one stop (51 Penang Street 012-463-5502). They plucked out all small hairs on my face, including eye brow shaping, for 15RM (3GBP, 450JPY). It was quite painful around above ears but my face is as smooth as a boiled egg now! I like the way you changed the colour scheme of your blog to match your dress.